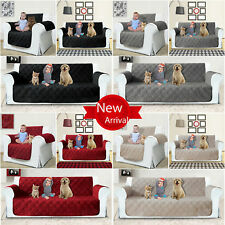 Size: 130 x 180cm. Designers Guild Throw / Blanket. This is a very luxurious throw by Designers Guild. It has a cream background with grey, pink and brown stripes. Pure Handwoven. ● A Treasured Gift:Exquisite and pure hand-woven technique.Super chunky, 100% handmade and pure wool yarn blanket,it's a treasured gift for your lovers,families,parents,friends etc. Due to the handmade nature of the knit, the actual size may shift or stretch slightly. 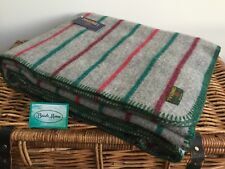 BNWT PRIMARK HBO GAME OF THRONES TV SERIES SUPER SOFT BLANKET THROW 120 X 150 CM. Condition is New. Dispatched with Royal Mail 2nd Class. 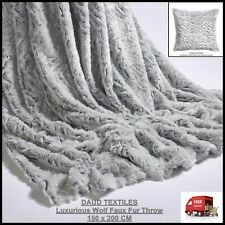 Zara Home Throw Blanket Grey 72” X 56”. Condition is Used. See photos - it is grey, my camera seems determined to show some pink/ purple. There are a few catches & I’ve tried to show them. Dispatched with Hermes. Grey Blanket Throw Tassles. Condition is Used. Dispatched with Royal Mail 1st Class. Made.com Narvik Stripe Knitted Cotton Throw 130 x 170cm, Grey and MustardBnwt. Condition is New. Dispatched with Royal Mail 2nd Class. The throw is reversible with both the front and reverse sides made using a grey colored super soft fleece style fabric with a recurring pattern of the different House crests. This would be a wonderful addition to any room and a must have for any fan of the hit TV series. FREE UK MAINLAND TRACKABLE DELIVERY SERVICE ! SUPERSOFT FRETTE WOOL BLANKET THROW GREY WITH STRIPE FRINGED ITALY W52" L65"
Lovely Next WashedThrow Lilac/Grey 150x200 cms Smoke Free Home We Post Next Day.